Finally! This Friday night marks a few things: 1) The start to what will surely be one of our last warm weekends; 2) Temps in the damn 80s, #forreal; 3) Our parking lot party of love and food and drink and music! Our Brew + 'Q is finally here, gang! Whaaaaaaaaat?!?!? Obviously, the evening will be loads of fun, but not just because of us. Noooo, no. We've been busting tail over the last several weeks to make connections, secure some merriment, and perfectly plan how you might just have a perfect Salt Lake City Friday night. To that end, we're pleased as southern punch to tell you that some of our favorite, stellar-as-hell locals and businesses have jumped on board to make sure we're guns blazing for the evening. They'll be here with us, peddling delicious bites, tasty beverages, and groovy tunes, and we could NOT be more thrilled to have them. Surely, it goes without saying that we don't want to ruin all the surprises for you, but still...we've got to lay down who's who in the land of local businesses we love. ROLL CALL! Salt & Smoke. SLC's answer to "Abe Froman, Sausage King of Chicago" is Frody, owner of Salt & Smoke. Their wursts are the best, and these fine meat masons will be squarely at the grill, dishing the best Andouille you've ever noshed. Rye. Diner & Drinks, Whiskey & Waffles...our love for this crew and the dishes they're dealing is well documented. Decidedly, these cats are going to make aaaallll the mouths water on Friday night. It'll probably be something amazing, like grits. Or southern fried peaches. But you'll have to be here to find out. Saturday's Waffle. Oh, yes. They blew our COLLECTIVE minds at last year's Brew + 'Q, and we assume that's enough to get you all to come back for more. Bananas Foster waffle? Drool. Plus, they look categorically adorable in those bow ties. 3 Cups Coffee. We've waxed a touch poetic on the design of their Holladay location, sure, but there's more to 3 cups than good taste. Namely, Amber...a pastry producer of the kind of things you want in your mouth now. Like beignets (hint, hint). Pat's BBQ. These guys have got a name of their own, no doubt. They've been around the BBQ block, and the list of awards is lengthy. Diners, Drive-ins and Dives gave them a visit, followed by a solid thumbs-up. And if you wanna try a drumstick or a touch of slaw, you best work your way to our parking lot. Oh, and drinks? Suuuure, we'll have drinks. 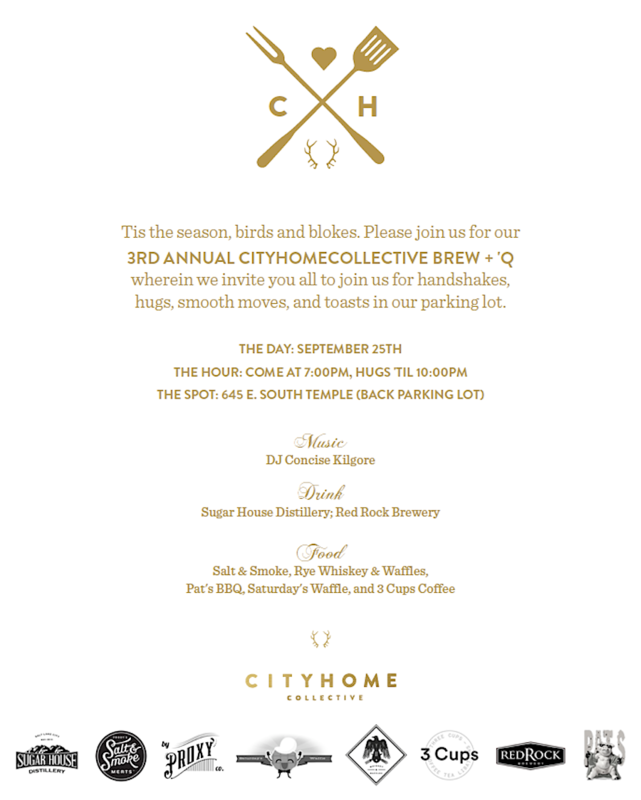 By Proxy Co., will be pulling the strings behind the bar, pouring magic from the bottles of Sugar House Distillery (makers of top-notch vodka and rum, and some dudes worth high-fiving so hard) and Red Rock Brewery (crafting the stuff that makes you wanna open wide and post up just below the tap for the night). If only you had a private party to sip some finely-crafted, punchy libations and mingle with pals (wink). As ever, we want you to just enjoy...but if you feel so inclined to whip out your phone and capture some photos/video of the night, we say "do it." Slap a #cityhomeCOLLECTIVE on it, and maybe we'll casually peruse those babies come Monday. And maybe we'll have a prize for our favorite photos/videos of the night. And maybe you'll win and we'll become best friends. It's a magical night, man. Anything can happen.